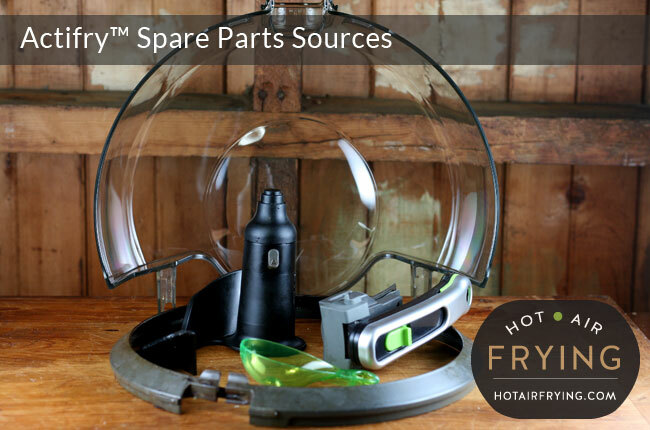 The Actifry™ spare part business is a going concern and seems to do a roaring trade. While you might initially think that’s bad news — why is such a supply chain needed? — ultimately, it’s good news to realize that you won’t be out in the cold should something go wrong. sadly we can’t help you locate a specific part for your specific model because we won’t pretend to be authoritative and knowledgeable about every single detail of every single model — again the part seller should be able to provide accurate information that we can’t possibly. the links are provided “as is” for your reference only and should not be construed as an endorsement of any site. It’s our hope that these source links will at least save you some time in figuring out where to start looking. Realizing that your cherished Actifry machine has a problem can cause a great deal of anxiety. Most parts are relatively inexpensive and can be in your hands quickly to have the machine back up and running in a matter of days. And, Actifry parts are constantly improving: chances are that the replacement part you get will be of a better quality, even if just slightly, than the original was. As for the engines / motors themselves, I do recommend whenever possible purchasing an Actifry with an extended warranty. But, if you couldn’t, or didn’t, or did but it has expired, don’t worry: I have read several people saying they were able to source engine / motor parts relatively inexpensively and replace them quite easily. So don’t panic. It will take a few days and a few bucks to solve your problem but not a lot of either, so you should be back in business shortly. When you are looking for or ordering spare parts the very first thing you’ll need to know is your model number. 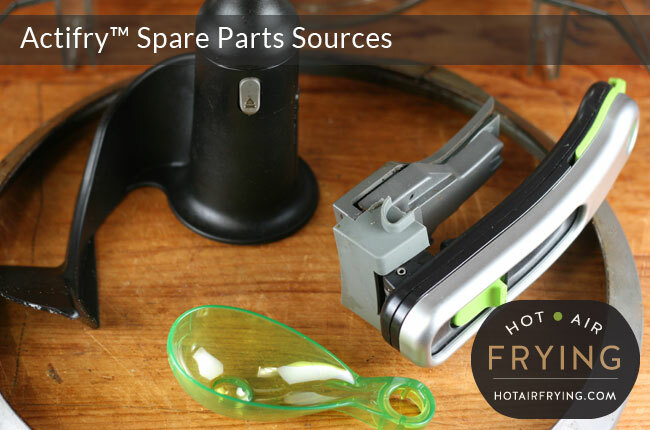 A pan or paddle from one Actifry model in most instances won’t fit another. 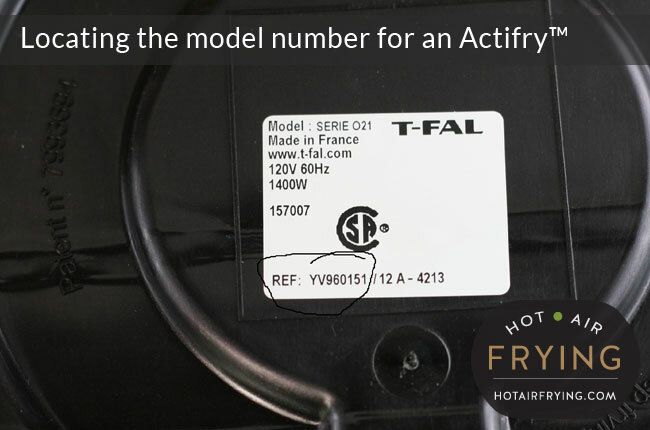 The Actifry model number is on the bottom of your machine. Unplug your Actifry, and make sure it is cold and empty. Gently turn the machine over so that you can see the bottom of it. Look for the “rating plate” information. It may be pressed right into the material of the machine base, or it may be a label that is stuck on. The model number will be the line of characters following that word. Often, Actifry models start with “AG”, “AH”, “FZ”, “GH”, “YV”, etc, and then a series of numbers. Knowing your model number should drastically reduce if not completely eliminate your chance of getting the wrong part for your model. To start you could do worse than a quick search on Amazon for Actifry parts just to get an idea of availability, price ranges, etc. If not, you can turn directly to sources located where you are. Don’t forget: web sites can be useful in helping to inform yourself about parts availability and price ranges, but if a seller offers a customer service line phone number, it never hurts to phone and grill them directly just to re-assure yourself you’ve identified the correct part. And, if you don’t see the part you need listed on a seller’s site, contact them and ask: often times parts providers will have the part but just not have gotten around yet to listing it! Please let us know of any sites we’ve missed. Please note we only list sites that are actual direct parts sellers themselves; not sites that are compilation lists of links to other sellers on Amazon, Ebay, etc. Note: SEB is the overall maker of Actifry; it is SEB that runs the various “Home & Cook” sites. T-Fal Canada / Phone: 1-800-418-3325. Monday – Thursday 8:30am – 4:30pm, Friday 8:30am – 1:00pm. As of November 2016: Abtec Parts. Supplier of Actifry spares as well as a wide range of SDA spare parts.